Music is an essential element in the spiritual formation of children. 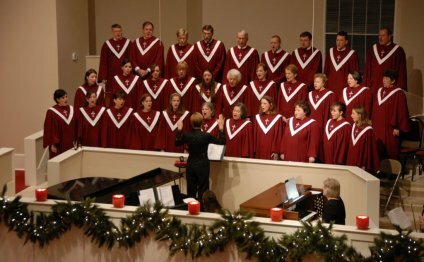 The choirs at Lafayette-Orinda Presbyterian Church provide spiritual formation and nurturing through integrated instruction of choral technique and worship leadership in the Christian tradition. An introduction to choir which teaches children to use their vocal instrument, experience rhythm and creatively express themselves in song. Sunbeams is designed for children who are ready to independently participate in group activities without the assistance of an adult. Sunbeams sings in Sunday morning worship and on Christmas Eve. A beginning-level choir for teaching the fundamentals of making music as a team and worship leadership skills. Children learn classic choral singing techniques while preparing anthems to sing in Sunday morning worship and on Christmas Eve. Emphasis is on pitch, rhythm, voice placement, choral vowels and interpreting text to effectively communicate through song. Singers must make a reliable commitment to weekly rehearsals throughout the program. An intermediate-level choir which teaches vocal technique and the foundations of part singing. Choristers practice proper use of their vocal instruments while preparing anthems to sing in Sunday morning worship and on Christmas Eve. Singers must make a reliable commitment to weekly rehearsals throughout the program. We have several volunteer opportunities to help juggle the needs of this continually growing program. Jobs range from helping to set up the classrooms each week, managing choir robes, greeting children as they arrive, being an extra set of hands for the directors during rehearsal, answering parent questions and providing snacks. Opportunities are available on Friday mornings and Sunday mornings. You do not need to be particularly musical to help. The Choirs for Children and Youth at Lafayette-Orinda Presbyterian Church strive to nurture confident worship leaders through music education and spiritual formation. During weekly rehearsals, choristers are not only learning to use their vocal instruments and preparing pieces for worship. They are learning teamwork to create a meaningful musical experience for themselves and the congregation. Just like every player on a sports team is crucial for the strength of the entire team, every member of a choir is vital to the success of the group as a whole. The children learn to trust in, and rely upon, one another to make music. The power of the choral experiences comes from the sum of each unique voice being lifted together in song. It is the magic of the music-making process that can only happen in rehearsal together.